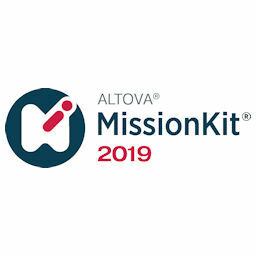 Altova MissionKit 2019 Professional Edition is a software development suite of industrial-strength XML, SQL, and UML tools for information architects and application developers. Powered by RaptorXML for lightning-fast processing, Altova MissionKit Professional includes Professional Editions of XMLSpy, MapForce, StyleVision, UModel, and DatabaseSpy - all at substantial savings. XMLSpy is the industry leading XML development environment for modeling, editing, transforming, and debugging XML-related technologies. In addition to the world’s most popular XML editor and graphical XML Schema 1.0/1.1 designer, XMLSpy offers file converters and debuggers, plus support for XSLT 1.0/2.0/3.0, XPath 1.0/2.0/3.0, XQuery 1.0/2.0/3.0, HTML5, JSON, all major SQL databases, and more. MapForce Professional is a graphical data mapping, conversion, and transformation tool for integrating any combination of XML, SQL databases, and flat files. It converts data instantly and supports automation via MapForce Server. It even includes an innovative data mapping debugger. StyleVision Professional is a visual tool for designing compelling reports and forms based on XML and SQL database inputs. It makes the power of XSLT available in an intuitive and visual design tool, making it possible for developers and designers to focus on their target designs (in HTML, RTF, and e-Form formats) rather than XSLT details. UModel is a UML modeling tool that supports all 14 UML 2 diagrams, database modeling, BPMN, SysML, and a UML-style diagram for XSD. It supports model creation, code generation, and reverse engineering for Java, C#, and VB.NET, plus Visual Studio and Eclipse integration. DatabaseSpy Professional is a unique, multi-database query, design, and comparison tool that connects to all major SQL databases to simplify querying, visualizing, managing, designing, and comparing relational databases. Tight integration between products in Altova MissionKit provides a seamless development experience.